This new and simple “property” means that the software now lets the developer add an overlay (i.e. anything) on top of the camera view finder while you are aiming the “camera” at a scene in front of you. That’s it! Pandora’s box is now open! How does AR work? It is by no means a revolution in the technical sense; it is merely a re-rendering of what we have grown accustomed to: GPS & POI (Point of Interest) mapping. In fact, one may argue that augmented reality begins with the arrival of GPS devices, and improved with newer generations of network enabled devices (real-time traffic updates, etc…). However, rendering on first-gen GPS devices was simulated in 2D or at best in 3D and not “real” looking. So the term was not really legitimate. 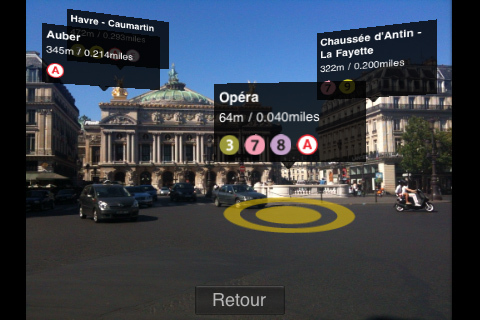 AR starts with the camera view finder, the GPS location, and the compass. This trinity allows the device to know where you are, and in which direction you are looking at. The camera view finder is inevitably what you are looking at (or at least, usage makes this true). Then it is only a matter of adding the POI on top of the view finder, perhaps changing the size of the objects by using simple math and distance calculation (big = close, small = far away), perhaps with an arrow to indicate direction. Today, the category is blossoming, bringing us AR centric applications as well as applications where AR is just a subset of the main app. The benefits are obvious for tourists in need of help to go from A to B in unknown territory. In the same vein, AR may provide additional context in finer grained environments such as Museums: http://www.cultureclic.fr was recently awarded a French subsidy to develop such a service. Now let’s venture into the world of work and into the future. How may AR be applied to this context and especially as a tool to the information workers? Are we far off? Can we add context to people as much as we add context to maps and locations? Imagine the possibilities of using this in a mixed context: in a large meeting with customers & partners, in a forum or round table. The hypothetical productivity gain would be gigantic: no more wasted time on missed document, improved efficiency in finding related material or individual skills needed to achieve the goal of the meeting. Also, imagine using this tool to maximize the number of relevant encounters: prospects, clients, colleagues – that you would have otherwise missed by lack of knowing better. 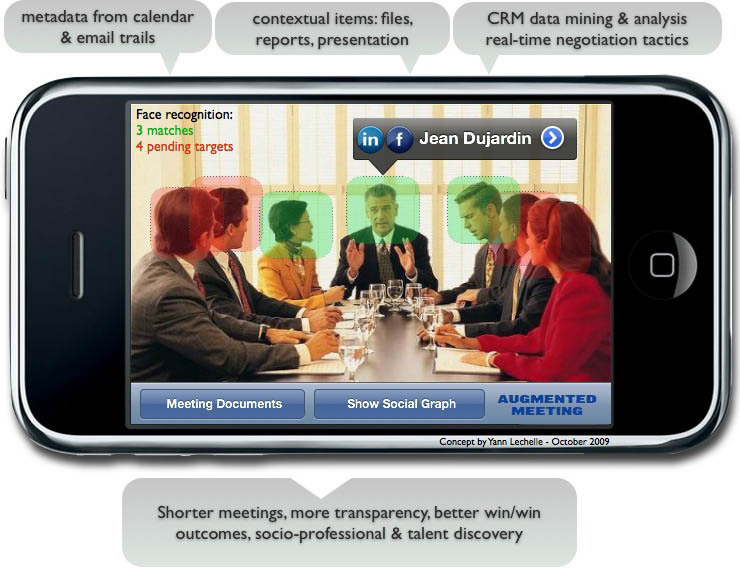 The social graph is only available online today; with augmented reality, the social graph springs in front of you. Unfortunately, one could easily envision a worse scenario: polarization of the workforce and creation of a new digital divide, this time within reality, leading to an increased pressure on the individual to expose herself digitally, perhaps even leading to reality withdrawal. Then the regulators will step in, stating that pulling a smartphone out of your pocket is prohibited in meetings that involve more than 2 people… A dystopian future again. Or not. We will find out soon enough. The most important notion that you stress here, to me, is the productivity gain. But it is a new sort of productivity. What I would call personal productivity on one hand and social productivity and social intelligence on the other hand. Business productivity i.e. labor productivity is impacted too, but to me this one is a classic one. The two others are more news. The personal productivity is the one by which an individual, if he chooses to use AR in his business or private life, and he will, can maximize both the use of his time and the aggregation of available information for arriving faster at decisions. This is pure productivity since otherwise his time would have been lost for accessing information, or the information would have never been extracted and the decisions could have been taken wrongly. The enhanced GPS for looking for hotels or tube stations are good examples of this. The social productivity is one that is rarely measured but is the one by which socially we stop losing time thanks to tools. The most important one for instance appeared already with e commerce when instead of moving to a place and queuing at the cashier or waiting for a teller to be free (remember the time when train tickets were bought at the station !) you could shop from home. 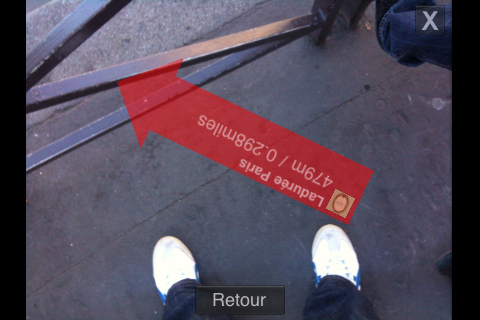 Today thanks to AR we stop losing ourselves in streets, we find immediately the place where we want to go, etc. But this goes further and into what I would call social intelligence. Part of the social productivity relies on the knowledge individuals have of their environment, culture, business, economy, history, etc. One can assume that an informed individual will become more socially productive, i.e. socially enriching himself and the others. And AR allows an incredible access to culture and information, from news to museums, to streets, to NearestWiki, to history, etc. leading potentially to a richer society. Already, in discussion with friends, when a question arises, it is possible to look for the answer out of a quick search on wikipedia or other base, but with AR any context related question will soon find easily an answer. An anecdote, I was looking on my iPhone at the stars in the sky, identifying them with an AR application (starwalk or distantsun), at a terrasse in the South of France one evening last summer. Soon several customers and their kids wanted to learn more about the stars we were looking at and engaged in conversations on astronomy. A real interest emerged. A real thirst for knowing more emerged. It is just an anecdote but if AR sparks curiosity, I can bet, it will spark innovation and progress. To me the future of AR may bring bad surprises but overall it will also certainly bring large progresses in productivity and social intelligence.